I write to you from Jerusalem to address the very serious refugee situation affecting countries across the Middle East and now Europe. I myself am a refugee, as well as a bishop. Both my faith and my history oblige me to speak up for these women, men, and children who are washing up on beaches, are found decomposing in trucks on the highway, are crossing borders of barbed wire, and are barely surviving in makeshift camps. The last weeks have seen not only an increase in the numbers of these refugees, but also an increase in tragic outcomes for many. This is a shameful situation, and one which the international community cannot ignore. It must be remembered that refugees are not vacationers. They did not leave their homes because they were looking for adventure. 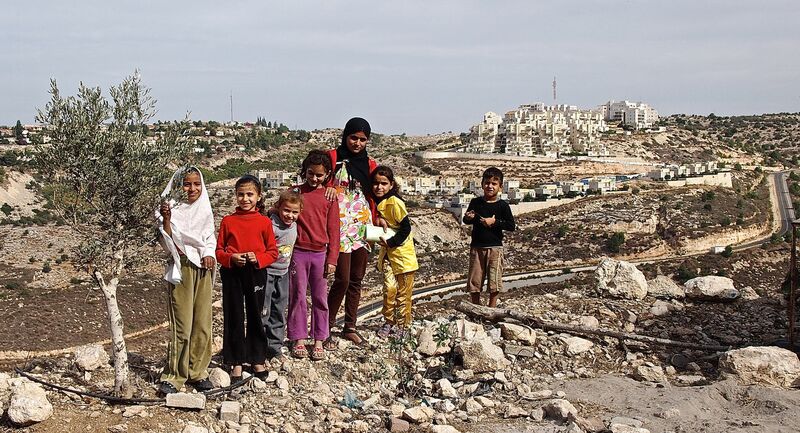 They are displaced as a result of poverty, violence, terror, and political conflict. Frustration and fear lead them to risk their lives and their life-savings in search of safe havens where they can live and raise families in peace. We must remember that these are not “waves” or “masses” or “hordes”—these are human beings who deserve dignity and respect. A reflection on Luke 24:13-35 as a model of Accompaniment from EAPPI’s 2014 Annual Meeting. ‘Imwas before 1967. 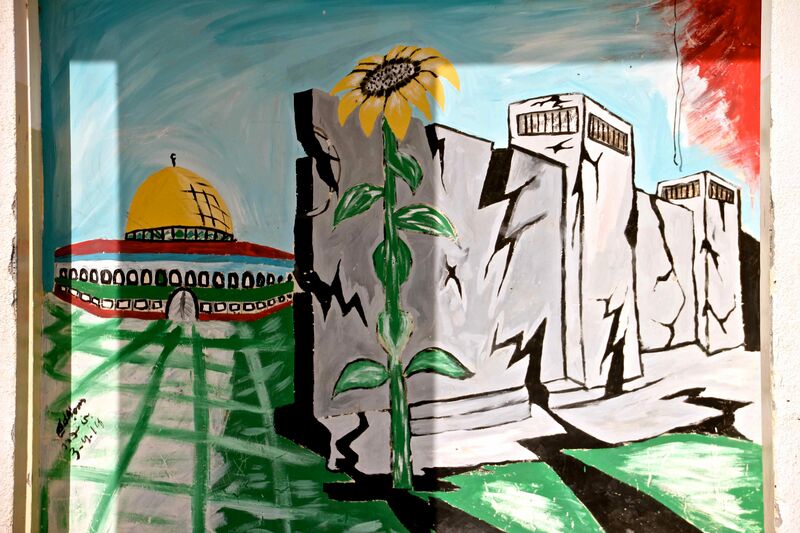 Photo c/o http://www.palestineremembered.com. 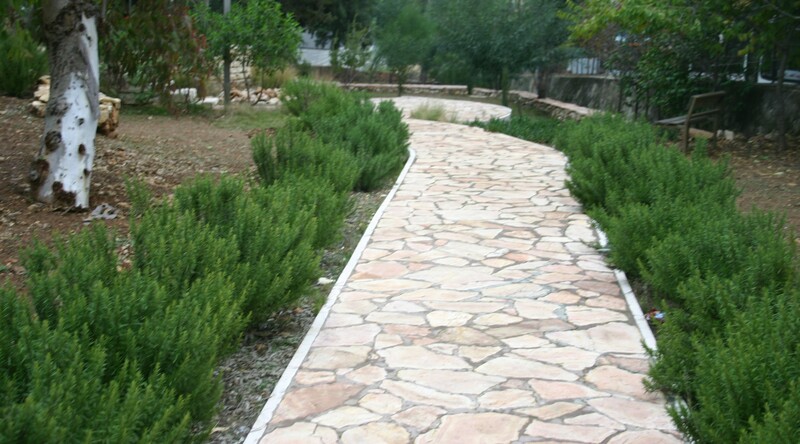 The ancient city of Emmaus is where the West Bank Palestinian village of ‘Imwas used to be. Its buildings were leveled, its residents expelled, in 1967. Today it is Canada Park, a popular Israeli leisure spot. It is operated by the Jewish National Fund, established with $15 million of support from Canadians. A series of signs in the park describe the historical significance of the landscape, and a handful of ancient buildings, in terms of their Biblical, Roman, Hellenic, and Ottoman pasts. But no mention is made of its recent Palestinian past. The biblical story of Emmaus is in a place that has become a contemporary story of dispossession, of injustice. And so here we are – the global church, most of us foreigners, outsiders, responding to the local church, to our Palestinian brothers and sisters to accompany them, to walk together, as we work to end dispossession and injustice. What does this passage of the road to Emmaus tell us about accompaniment? What can we learn from it as we begin these days together to discuss our work? Many commentators on this passage highlight that it is only at the end, at the table, in the breaking of bread that the two men finally see and understand who is before them. At first they didn’t recognize Jesus, he is a stranger to them. They think he is a foreigner, from another place, and doesn’t know of the terrible things that have happened, the sorrow they are feeling. But then he takes the bread, blesses it and breaks it, and gives it to them. Then their eyes were opened, and they recognized him. I’m struck when I read EA accounts how often they make reference to drinking tea with people or being invited to dinner in someone’s home It is in these intimate spaces that ‘otherness’, ‘foreignness’, ‘strangeness’ are often overcome. “Say yes to tea” an EA emailed me when I told her I was coming to this annual meeting. But I am not a theologian. I am not a biblical scholar. Rather than expound further on my reading of the passage, I will turn to the refection of a church leader, a Palestinian, whom we know well. “Accompaniment in the Middle East is not a new notion. It goes back to the Old Testament. When the Hebrews left Egypt to Sinai, God accompanied them by cloud by day and by a fire that lit up the night (Exodus 14). It is this accompaniment as solidarity with the other that the Bible teaches us. Accompaniment took root in the flesh in God’s incarnation, when God became one of us. In Jesus Christ, God engaged with our brokenness and sin. He accompanied groaning humanity in order that it might regain the image of God through the salvation of the cross. So this accompaniment that God calls us to do as companions with the global Church is an accompaniment with groaning humanity that seeks forgiveness and the justice of God in order that all may be brokers of justice, instruments of peace, ministers of reconciliation, and defenders of human rights. “Your accompaniment is similar to the road of Emmaus. We walk together as equals in humanity, and as equals in salvation. We walk together bowed in head, seeking the truth, comforting the Church of God. We accompany each other, trusting that in our wonder and uncertainty, God will inform us of our mission and our witness in a broken Holy Land. For this reason, accompaniment is an instrument and tool of the Holy Communion through which we are commissioned to be God’s witnesses for justice, peace, and reconciliation. It makes both companions witnesses of hope in a hopeless situation, witnesses of love in a world of hatred and retaliation, witnesses of faith in a world that ignores God, witnesses of truth in a world of propaganda and lies. Steve Weaver is the Middle East Regional Coordinator for Church World Service, and the EAPPI National Coordinator in the USA. 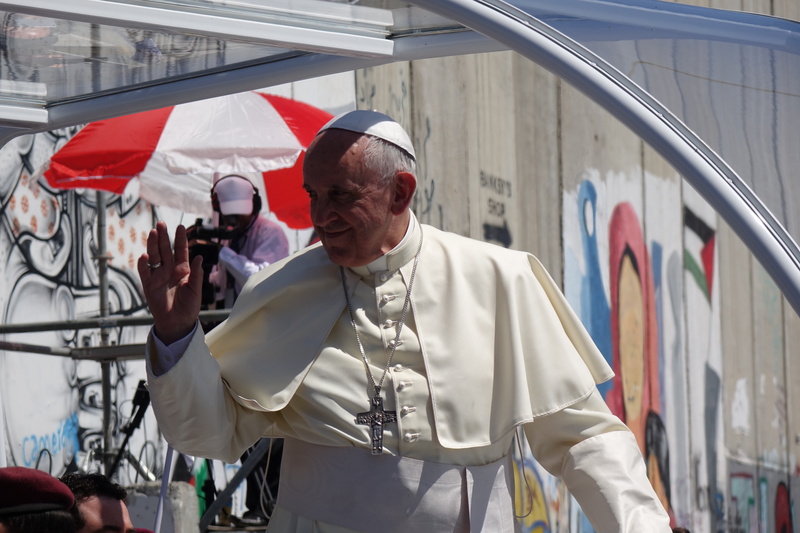 Pope Francis waves as he makes his way past the separation wall and to Manger Square in Bethlehem. Photo EAPPI/C. Holtan. From 24 to 26 May, Pope Francis made a 3-day tour to the Holy Land, making stops in Jordan, Palestine, and Israel. In Jerusalem, the Pope’s visit was clouded when Israeli security forces used violence against Palestinian Christians marching toward the passage road of the Pope to welcome him. Yet, a peaceful and celebratory visit to Bethlehem and Pope Francis’ acknowledgement of the difficult reality of the Palestinian/Israeli conflict left many Palestinian Christians with a feeling of hope. In Bethlehem, Pope Francis made an unexpected stop, stepping down from his vehicle where he rested his forehead against the separation wall, which cuts off Bethlehem from Jerusalem, and said a silent prayer. On the wall in the background, someone had sprayed a graffiti message: “Pope we need someone to speak about justice.” Photos from this stop have now become iconic across the media. Bishop Munib Younan of the Evangelical Lutheran Church of Jordan and the Holy Land, commended the Pope for being willing to acknowledge the reality of the situation in Palestine. 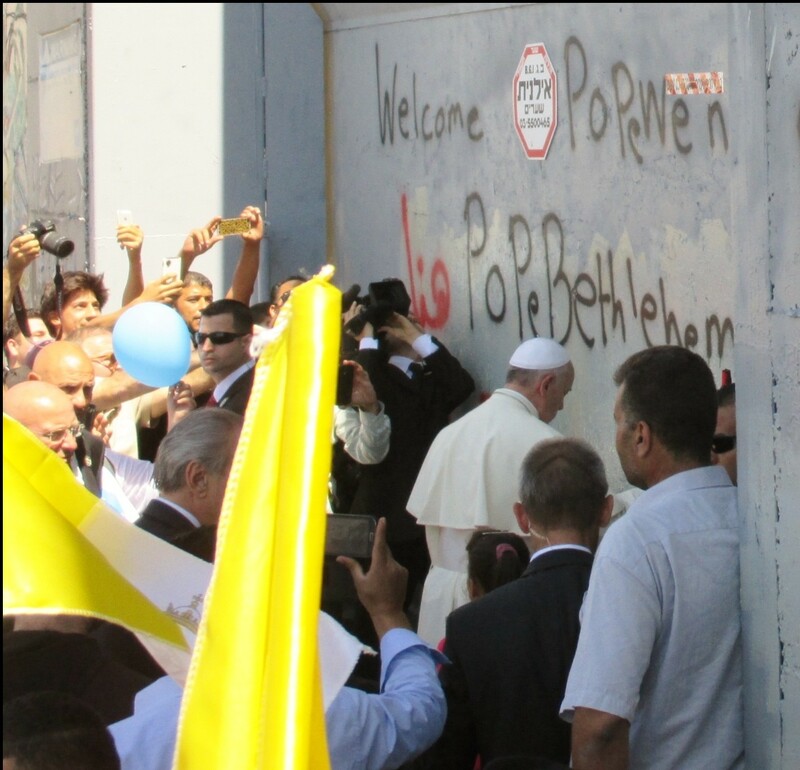 The Pope steps down from his vehicle to say a prayer at the separation wall in Bethlehem. Photo EAPPI/E. Mutschler. “I think that leaders like Pope Francis, when they visit, should not just meet officials, but should see the reality. The reality is that there is a wall that separates Palestinians and Israelis, Palestinians and Palestinians, and Palestinians from their land. 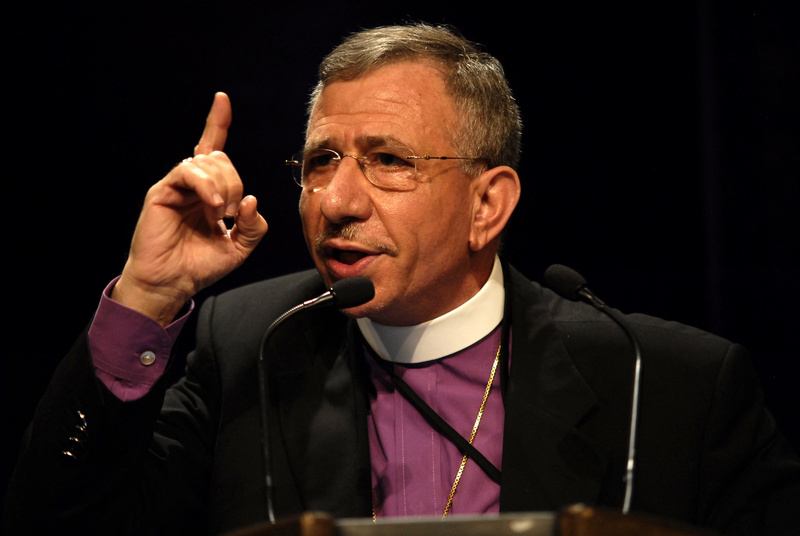 Pope Francis, I believe, prayed that this wall would no longer exist and I say this prayer with him!” Bishop Younan commented in an interview. He affirmed that everyone will benefit from “the need to intensify efforts and measures to facilitate a stable peace based on justice, recognition of the rights of each individual and mutual confidence.” Interestingly, the nativity mural behind the Pope’s seat depicted baby Jesus lying under a keffiyeh style cloth. 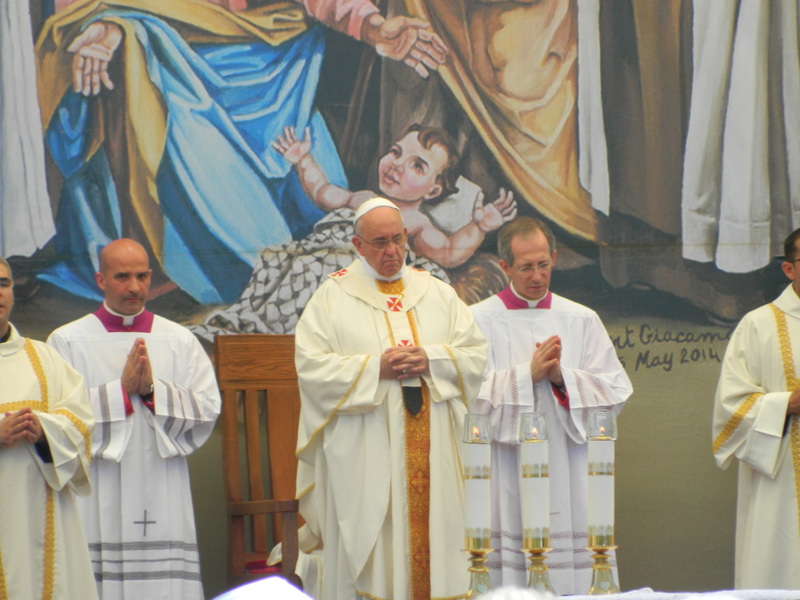 The Pope spoke at the Mass in Bethlehem in front of a mural of the baby Jesus under a cloth styled like a Keffiyeh, a traditional Middle Eastern headscarf. Photo EAPPI/L. Hilton. In Jerusalem, the experience of Palestinian Christians was not a peaceful celebration as it was for those in Bethlehem. At least 3 Palestinian Christians who joined a procession to welcome Pope Francis during his visit to Jerusalem were arrested for a brief period by Israeli security forces when the Pope arrived on Sunday. 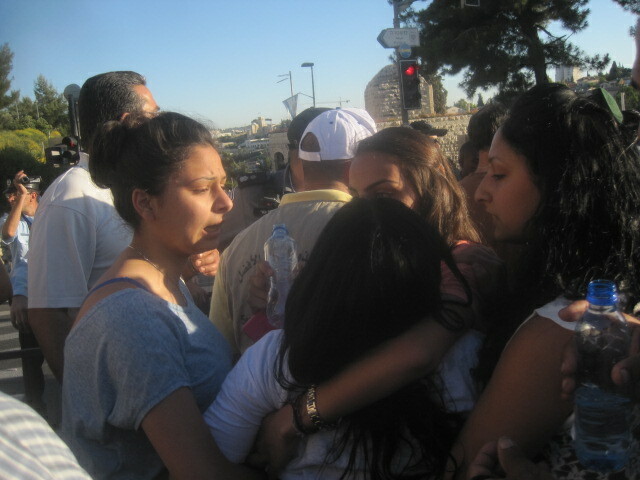 Others were injured due to use of physical force by Israeli police. A young woman holds a woman who was injured by Israeli security forces. Photos EAPPI/A. Macarimbang. 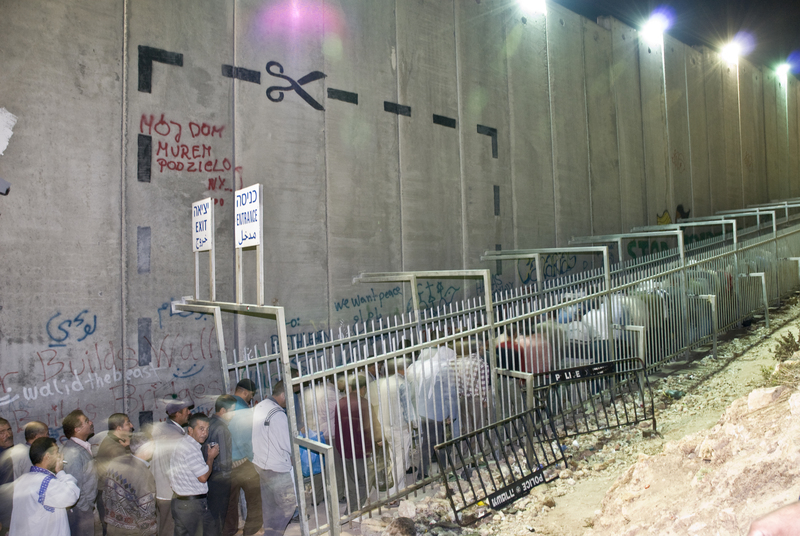 Israeli security forces ordered several changes to the planned route, resulting in confusion, overcrowding, and tension. 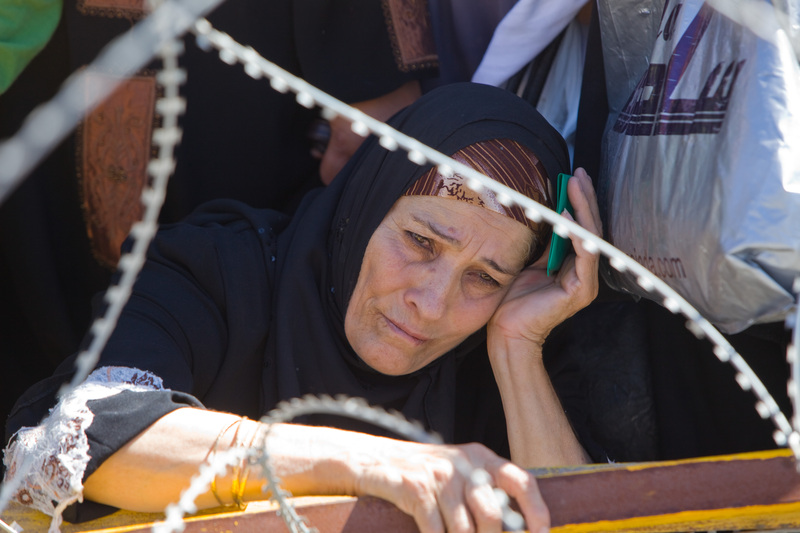 EAPPI human rights monitors reported that Israeli police began to use metal barriers to push the crowd back. Two men who became upset were beaten and arrested by Israeli police. Another girl was injured when she was crushed in the pushing back of the crowd. When the procession arrived to Jaffa gate after the first rerouting, Israeli police did not allow any Palestinian Christians to enter Jaffa gate. They formed a chain to block the people from entering, which caused stress and anger among those waiting to greet the Pope. “Even when the situation calmed down, many Christians were disappointed that they were not able to welcome the Pope,” described EAPPI human rights monitors.